Srila Rupa Goswami is the central acharya of the Gaudiya Vaishnava school of devotional service. 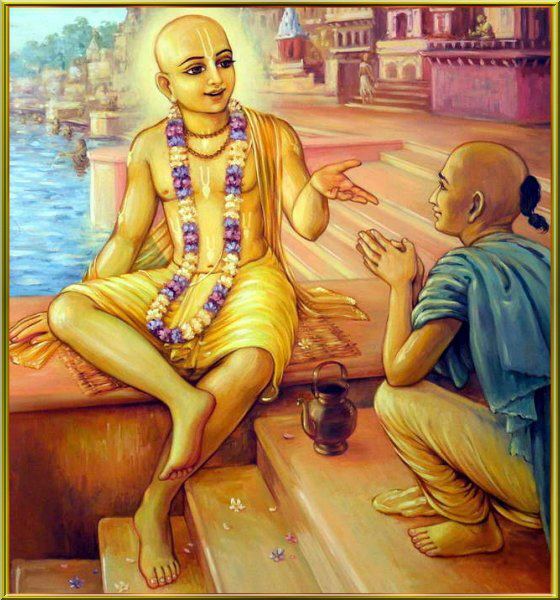 He is the direct disciple of Sri Chaitanya Mahaprabhu, the incarnation of Godhead in the iron age of Kali who appeared 500 years before in the land of West Bengal, at Mayapur. He is the foremost of the six goswamis, who are the direct disciples of Mahaprabhu himself and they were empowered by him to preach the message of Bhakti cult, write devotional literatures and discover the places of pastimes of Sri Sri Radhika and Madhav. He made his appearance in the year 1489, his exact date of appearance is not known. He was the son of a south Indian brahmin Kumaradeva and his lineage traces back to Bharadwaja, one of the important rishis. He had two brothers as well, Sri Sanantan and Sri Anupama. On the demise of Kumaradeva, the three sons moved to Sakurma, near the capital of Gaudadesha (Bengal) where they continued their studies. The three brothers studied the Nyaya-shastras (treatise on rhetoric) from the famous logician Vasudeva Sarvabhauma Bhattacharya and his brother Madhusudana Vidyavachaspati. They also studied Sanskrit, Arabic and Persian. Due to their noble characters and academic proficiency, Rupa and his elder brother Sanatana were later forced into government service by the Sultan of Bengal, Alauddin Hussein Shah (1493-1519) which led to their excommunication from Hindu society by the orthodox caste brahmanas of Gauda. Rupa became the Sultan’s chief secretary (dabir khas), while Sanatana became the state revenue minister (sakara mallika). There, mahaprabhu instructed him in the science of Krishna Consciousness and gave him a 10 day instruction, thereby empowering him and making him eligible to preach. He then sent Rupa Goswami to Vrindavan to carry out these tasks. Rupa Goswami first arrived in Vrindavan along with his elder brother Sanatana Goswami in the year 1516, after receiving the direct order of Lord Chaitanya. Through his writings Shrila Rupa Goswami chalked out the perfect spiritual path for all the followers of Lord Chaitanya down through the ages. Throughout his life, he dedicated himself to the order of Mahaprabhu and served his beloved deities, Sri Sri Radha Govinda which are in a beautiful temple in Vrindavan, built by Sawai Man Singh. Shri Rupa Goswami completed many literatures, among them: Shri Hamsaduta Kavya, Sgri Uddhava-sandesh, Sgri Krishna-janma-tithi-vidhi, Brhat Radha-Krishna-ganoddesha-dipika, Laghu Radha-Krishna ganoddesah-dipika, Stavamala, Vidagha-madhava, Lalita-madhava, Dana-keli-kaumudi, Bhakti-rasamrta-sindhu, Ujjvala-nilamani, Prayuktakhyata-manjari, Mathura-mahima, Padyavali, Nataka chandrika, Laghu-Bhagavatamrta, among others. He disappeared from this material world on the Shukla Paksha Dwadashi of Shravan. This entry was posted in Mythology and tagged auspicious, Bhakta, blessings, devotees, divine, Everything begins with faith, faith, happiness, Hindu, hinduism, Rupa Goswami, Sages, shubhpuja, shubhpuja.com.